Parfyme Deluxe attempts to intimidate Flux Factory!!!! Click to watch!!! But Fluxers are hard to scare!!!! Parfyme Deluxe challenges Flux Factory to a true-blue capitalist competition. The dueling art-enterprises will divide Flux Factory, creating DeluxeFactory. The two factories will race to out-produce and out-sell the other. Each week will be a new product(s) assignment, demanding the entrepreneurs radically alter their factories and production methods. Each collective will hit the streets to deliver their innovations. Fantastic delivery trucks, espionage and sabotage will be just some of the tricks of the trade. Whoever sells the most wins. DeluxeFactory is a collaboration between New York/Copenhagen-based collective Parfyme Deluxe and Flux Factory. Hosted by Flux Factory, we will return Flux Factory to its original state – a factory. On conveyer belts, with big machines, a lunch-break whistle and on a 8-5 schedule, each group will go to work: producing objects, trinkets, and curios. For three weeks, at the end of each week, right on schedule, rain or shine, we will load up our truck and peddle our wares throughout New York City. As any production unit, we will be judged by the market and the costs of production. What market and what costs? – The rules and conditions will change for each new product: what is available for input, output, distribution and purpose. Constraints of all kinds will force each factory to apply new procedures and strategies to become successful. The fate of the products will be determined by consumers. The Flux Factory space will be divided: half for Flux, half for Deluxe. Neither outfit will be able to see the other, but above each factory will be a foreman’s catwalk, allowing spectators to walk over each factory, monitoring production, critiquing diligence. A few choice products will not be shipped out, but will go to two Factories’ showroom, where, despite the possibly grim working conditions of the Factories, the products will be displayed tastefully, bathed in futuristic lighting. Each outfit will work to dominate the market, attempting to drive the other out of business – or just stay afloat. We see in this show a very meaningful way to expand the way artists work together, as individuals and as groups, by working in a competitive atmosphere while needing to collaborate. By putting pressure on each other and creating a sense of interdependence, well both explore the means by which each artist produces and creates objects and working methods. Note: Visitors can come to Flux Factory to watch the production process during the week by appointment. Sunday, September 23, 1-5pm: Wrestlers duke it out at Coney Island while support crews sell memorabilia. 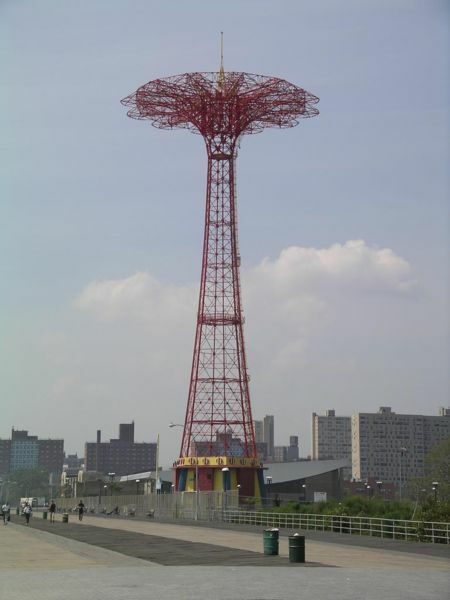 Meet at the parachute jump at the end of the boardwalk. Saturday, September 29, 1 -5pm: Boy Bands make videos, costumes, t-shirts, etc. Boy Bands battle it out! A winner is chosen! The Greenwall Foundation, and Carnegie Corporation of New York.